Description: A recently repainted and or rebuilt SD40-2 makes an apperance at the diesel shops. 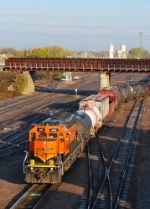 This unit is former BNSF 6824. 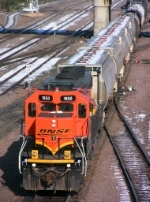 Description: BNSF 1850, former BNSF 6824 rests at the diesel shops. It sure was cool seeing this rebuilt/repainted unit. Description: Trailing DIT on the H-NTWPAS. Description: The 1850 works the pullout job on a cold October morning at 35th. Description: The "new" pullout unit passes the line of stored FURX SD40-2s that sit silent in the T yard. Description: I first shot this unit a little over a year ago in this very same spot. Now it calls this place home as it works the pullout on a daily basis. Description: The 1850 makes a light power move at 35th Ave with snow a light snow fall. Title: Whats in store next? Description: Some different power sits outside of the diesel shops waiting for what comes next. I'm guessing the 1850 is in for normal work. The LTEX switcher is a former SCL unit, that unit has seen a lot! Description: Idling the day away at 28th Street.